I frequently listen to XM radio’s sixties on channel 6 while I’m out and about. Last week, on my way to my cardiologist’s office, they played The Beat Goes On by Sonny and Cher. I visualized Sonny and Cher on stage singing, “Drums keep pounding a rhythm to the brain La de da de de, la de da de da,…. And the beat goes on, the beat goes on…” The lyrics reminded me of my Paroxysmal AFib (PAF), more commonly called intermittent Atrial fibrillation! When I’m in AFib my heart keeps pounding a highly undesirable rhythm in my chest until it resolves. Recently, during follow-up visits, my EKGs were normal. Yet, I was experiencing increased occurrences throughout the day and wanted the doctor to view an EKG when I was experiencing an attack. The doctor suggested that I visit a medical facility during an episode and have them send the EKG to him and he also offered to place me on a portable heart monitor to record my AFib incidents if desired. 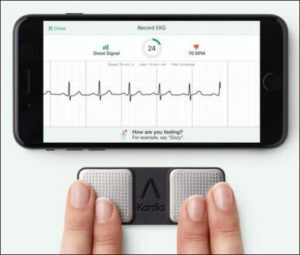 After my doctor’s visit I decided to purchase the new Kardia Mobile EKG monitor to track my AFib, it works with your smart phone and produces reliable and accurate EKGs! I now send reports direct to my doctor for his review. Basically, I know when I’m in AFIb and I’m now able to record the event. It only costs $99 and if you want them to store and compile detailed reports they ask for a monthly $10 subscription fee. They even have cardiologists available to review your EKG, you have several options, and they charge an additional fee for that service. The Kardia Mobile is easy to use and only takes a few minutes to set up, a great value for anyone needing to track their vitals. Retirees and those soon to retire typically experience health issues such as my AFIB that often take center stage. We have to be our own health care advocate because it’s unwise to blindly accept a medical provider’s first diagnosis without digging deeper into you or your loved ones issues. There are so many variables and too often doctors treat the symptoms without fully investigating your personal and unique situation. Had I listened to my first cardiologist I would have been on Coumadin and other caustic drugs 25 years ago! When I was in my late forties I was diagnosed with PAF. The cardiologist prescribed a portable heart monitor and I experienced numerous daily AFib attacks that raised my heart rate to 250 beats per minute and higher at times. Their office called after several episodes and requested I come in for medications, they prescribed Coumadin and other drugs. I researched the medications and discovered significant side effects and long term use issues. Fortunately, I sought out an electro physiologist for a second opinion and discovered alternatives. An electro physiologist is a heart specialist concerned with the electrical activity associated with bodily processes. He stated that as long as my heart returned to normal rhythm within a few hours from the onset I didn’t have to take blood thinners and other medications. Shortly after my doctor’s visit my wife was listening to a radio show that suggested those with irregular heart rates could benefit by taking magnesium glycinate tablets. I visited the Winer Wellness Center in Pittsburgh and picked up a bottle. I started taking a 100 mg tablet at the onset of an attack and my heart rate returned to normal within 15 minutes. I also take an 81mg aspirin tablet daily. Without the pills it often took hours for my heart rate to normalize. Today, I take three 50 mg tablets, one with each meal as a preventative measure, and additional doses when I have an episode. This routine has helped me control my Paroxysmal AF for over 25 years now without caustic medications. There are three types of AFib according to the Heart Rhythm Society. My wife had a similar medical experience. She was diagnosed with glaucoma in her mid 40s and has had numerous medical procedures and medications prescribed since. Her first doctor told her she had the worst case he had ever seen and he advised her that she would never be able to get off medications. The medication’s side effects included face swelling, red eyes, blurred vision, and much more. I was skeptical from the start and spent over two years researching the disease with my wife, interviewing doctors across the country and medical specialists and test equipment manufactures. She finally decided to transfer to UPMC in Pittsburgh to take advantage of their advanced diagnostic services. After many tests and much debate with her doctors we came to the conclusion that my wife’s Intraocular Pressure (IOP) readings were high in part due to her white coat hypertension. Whenever my wife gets near a doctor her blood pressure skyrockets, at home it’s normal! IOP trends higher with elevated blood pressure and after several years and numerous laser surgeries she was able to get off the medications. She did have the disease, just not as severe as they first thought. Plus the first doctor was using inferior outdated test equipment that showed progression when there wasn’t any. Thank god my wife refused the traditional surgical procedures her first doctor recommended that typically cause an immediate 10% loss of vision. UPMC studied her case and wrote several papers on the subject. I mention this today because we generally think that the medical profession can cure everything with medications, procedure or surgery when in fact there may be other options available. Even with the best surgery or procedure you may still have limitations or require meds for life. Before taking that leap investigate all options; yes trust your doctor but verify before proceeding. Sometimes, lifestyle changes can make all of the difference in the world if you can adapt them into your routine and take them seriously. Even though I’m very active and walk several miles each day I’ve had back problems for many years due to poor posture, lack of exercise, and working at a desk for most of my life. I’ve been to physical therapy many times plus visit a chiropractor regularly yet the pain and discomfort continued and was progressing. I decided to start yoga this year and to my surprise after several months of mild yoga exercises my pain has moderated considerably. In late December of last year I searched for yoga videos online and thankfully found Yoga for Complete Beginners with Adriene, a 20 minute light workout. I have been cautious and take new poses on gradually. I practice Monday, Wednesday and Fridays of each week and on Tuesdays and Thursday I try a different pose that Adriene offers in her Foundations of Yoga videos where she provides 40 videos, one for each pose. She also offers programs specifically for those with back problems and much more. The nice thing about yoga is that you practice at your own pace. It’s best to start in moderation with poses that suit your physical abilities without over extending and hurting yourself. For example, in Adriene’s Yoga for Complete Beginners 20 minute workout video, I don’t perform the downward dog pose, it puts pressure on my upper torso that can trigger my AFib. I hope to eventually incorporate a modified version of that pose after I’ve practiced yoga for at least six months or more. I’ve watched Adriene’s beginners video three days a week since early January and added other poses that target my back with success. For those who can’t get down on the floor, no worries, she offers a Yoga For Seniors Chair Program where you sit and perform gentle yoga poses. I read an article recently that suggested exercise can delay and in some cases prevent arthritis from taking hold. I don’t know if this is true but I do know that movement and exercise are essential for life. My wife and I wear Fitbit step monitors and have used them religiously over two years now. Mary typically averages over 10,000 steps a day all year long. I on the other hand average between 7,000 to 10,000 steps a day, my best day was 17,000 steps. In the summer months my average increases. When I first heard “The Beat Goes On” by Sonny and Cher I was in my prime and overall in good health. Today, many years later, I’m still active and enjoying life. It’s been a long journey and I am looking forward to what lies ahead. Hopefully, living an active life will allow my wife and I to watch our grandchildren grow up, spend quality time with our adult children…, and the Beat Goes On, La de da de de, la de da de da,…. !